The Spear (known as Torpedo in Europe and Oceania) is a large-sized bike in Mario Kart Wii. It looks similar to a torpedo or a blimp converted into a bike with an engine and exhaust pipes. The character's emblem is located on the front of the bike. It is also seen on both sides of it. The kart counterpart for this bike is the Jetsetter. The Spear can be unlocked by unlocking 12 expert staff ghosts. The Spear is the fastest bike in the game, and it also has good weight (which is tied with the Jetsetter). However, all its other stats are quite low. It shares the same drift stat as the Zip Zip and the Tiny Titan, but suffers from the worst handling, off-road, and Mini-Turbo among all bikes and its off-road is equivalent to the Flame Flyer's off-road. 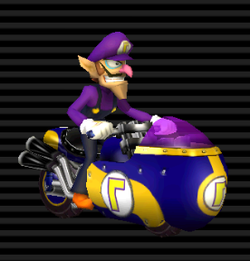 It is also the second heaviest bike in the game, after the Wario Bike. The Spear is one of six vehicles in Mario Kart Wii to go through a design change other than a palette-swap; the others being the Bit Bike, Flame Runner, Wario Bike, Shooting Star, and Phantom. In this case, Bowser's and Dry Bowser's Spear have their exhaust pipes positioned lower than the others. Also, Rosalina's and the Female Mii's Spear feature shorter handles. If Daisy rides on the Sprinter, its speed can surpass the Spear's default speed by one point. The Spear has the same acceleration stat as the Mach Bike. This page was last edited on March 4, 2019, at 17:23.